Enzyme applications are increasing in popularity due to their efficiency, and the green processing they offer. Enzymes do, however, have several inherent problems which restrict their use, such as their solubility and instability in organic media or under harsh conditions. Enzyme stabilisation and immobilisation aims to attenuate such problems. Immobilisation allows supporting or confining the enzyme for the duration of the reaction. This leads to improved product purity, allows the enzyme to be reused, offers the option of continuous processing and can increase enzyme stability, therefore increasing potential applications and improving process efficiency. Many of the current approaches to enzyme immobilisation, however, suffer from several problems such as long preparation times, tedious multistep procedures and loss of enzyme activity during immobilisation. Furthermore, due to the materials and techniques involved, many immobilisation methods could not be classed as green. These drawbacks therefore restrict their industrial applications. 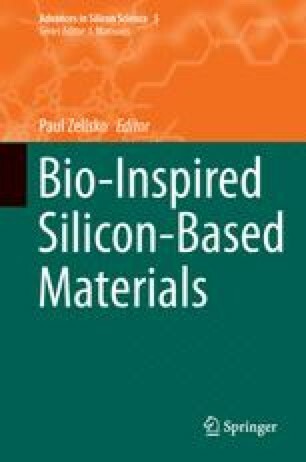 One promising area of enzyme immobilisation appears to be through immobilising enzymes using silica produced via a bioinspired route. Such routes aim to mimic nature’s approach to producing silica, and are favourable due to their simplicity, mild conditions, low cost and short preparation times. In this review, we detail various immobilisation techniques adopted, with example of lipases, and compare them with a recently developed bioinspired silica route for enzyme immobilisation. We hope that this comparison will enable us with a better understanding of this new method, as well as help identify its strengths and weaknesses. Zheng S (2005) Effect of Pore Curvature and Surface Chemistry of Model Silica Hosts on Biocatalytic Activity if Immobilised Lipase. (Electronic Thesis or Dissertation). Accessed https://etd.ohiolink.edu/. University of Cincinnati, Cincinnati. 1.Department of Chemical and Process EngineeringUniversity of StrathclydeGlasgowU.K.